MG15HFXMS, Solid-State Guitar Stack / Half Stack from Marshall in the MG4 series. Product replaced by the Marshall MG15CFXMS. The three-piece micro stack includes a 15-Watt compact head plus two matching speaker cabinets—one angled, one straight. Each cabinet is loaded with a full-range 10" speaker. In addition to being transportable, the MG15FXMS is also designed to allow many entry-level and budget-conscious players to enjoy the look, feel, and classic tone of the iconic Marshall Stack, according to the manufacturer. Preserving the features of the MG4 series, the MG15FXMS provides a three-band EQ section and features four programmable channels—Clean, Crunch, Overdrive1, and Overdrive2—to provide a range of tone colors from a single amplifier. The Gain, EQ, Volume, and Master Volume knobs are presented in Marshall's layout for ease of use. Push-button channel switching offers smooth, silent transitions, the company says. Digital Reverb is built-in, along with a full complement of Digital Effects—Chorus, Phaser, Flanger, and Delay. The Delay time can be set using the Tap button on the front panel, and the Effects are programmable to match each channel. The MG15FXMS Micro Stack provides a versatile array of inputs and outputs. The Line Input allows players to jam along with an MP3 player, CD player, or other source. The combination Line Out / Headphone Out features speaker cabinet emulation. The optional STOMPWARE footswitch is designed to provide seamless transitioning from sound to sound, as well as tap tempo control and display for the built-in tuner. STOMPWARE technology allows this multi-function pedal to be connected using a traditional guitar cable—eliminating the need for special or hard-to-find cables, Marshall says. The MG15FXMS Micro Stack carries an MSRP of $510.00 and will be available in October 2009. 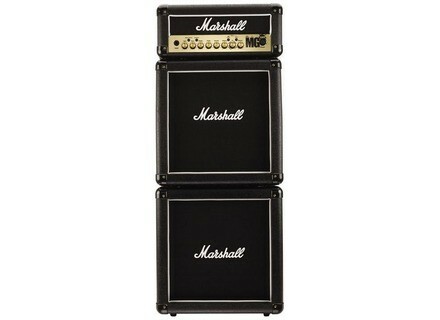 For more information, check out www.marshallamps.com. Marshall MG2FX Marshall Amplification has added the portable MG2FX to its popular MG4 line of guitar amps. TC Electronic Shipping Nova Drive Nova Drive is TC Electronic’s incredible new programmable analog overdrive and distortion pedal. Blade Dayton Standard & Deluxe Blade announced the expansion of the Dayton Series.